Scones with jam and lemon curd, cucumber sandwiches, and chocolate-covered strawberries – sounds like a tea party, right? Well, almost. 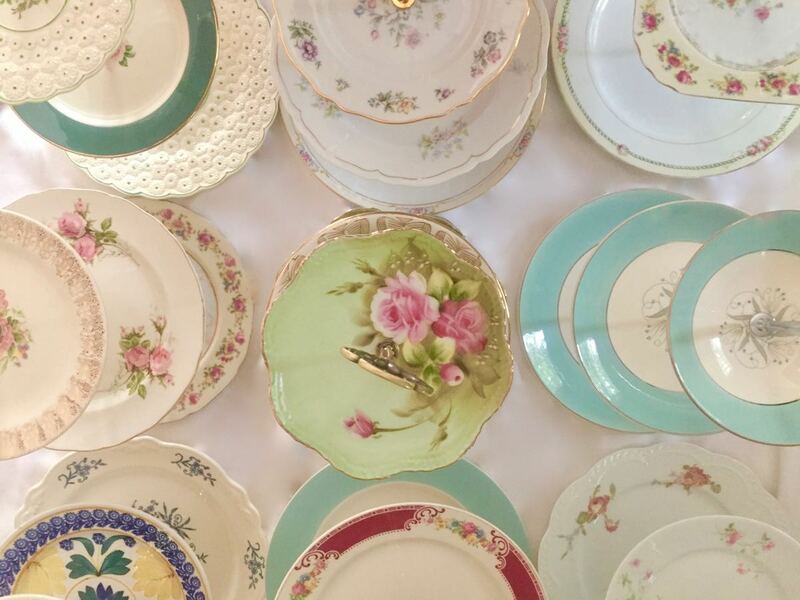 These delicious treats need to be presented properly to your guests, and yes, that means pretty vintage tiered stands. This week we have been preparing for a reception tea party to be held in Asheville next weekend for a very special bride, Jess. Her mother wants everything to be tea-party-perfect so we’ve been assembling and making tiered stands for each table. So far we have 11 ready with only 4 left to prepare and assemble. One of our older posts, “Make Your Own Tiered Stand,” has tips for making a tiered stand and the basics are the same. 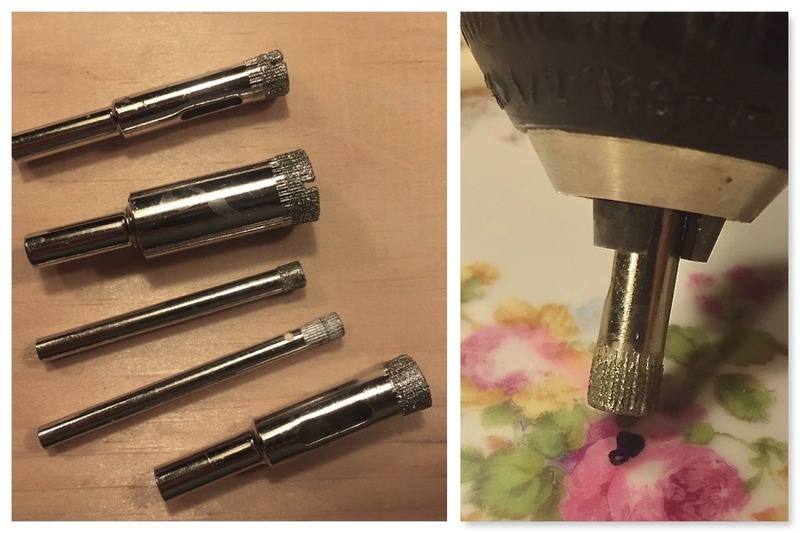 If you drilling into hard porcelain, we have a new tip to add – use a diamond-coated drill bit. Two biggies while using this bit – the drill bit needs to be constantly bathed in water and you only need slight pressure on the plate as it grinds the porcelain down. A second tip is to position the drill bit at an angle to start an indentation in the porcelain. Otherwise, the bit jumps around and it’s difficult to get it to stay put. After you get a nice quarter moon-shaped groove, you then can begin to move the drill slowly to its 90-degree angle and continue grinding through the plate. Patience and arm power also are needed! Once finished with your three plates, put them together with the hardware, get the scones in the oven, and start cutting those cucumbers! Of course, we are more than happy to provide these vintage tiered stands along with the other teatime essentials. Mark the date on your calendar for your tea party and give us a call! 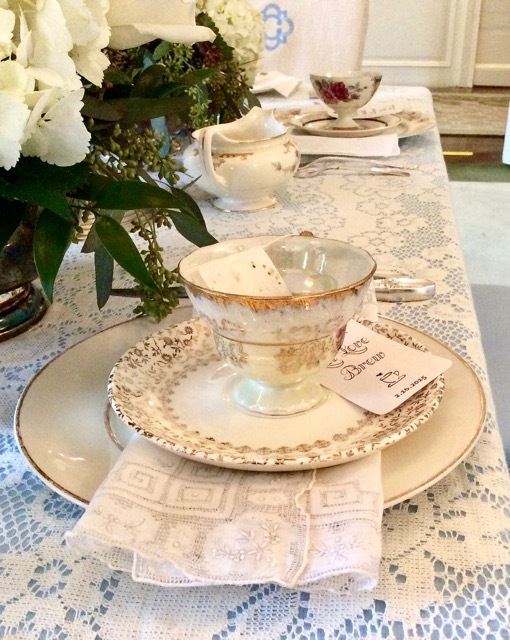 Previous PostPrevious Southern Vintage Table Event – It’s A Grandmother Shower!